1. The Contestants must be able to pedal the tractor without assistance. 2. Pedal tractors will be furnished for all participants. 4. All contestants will be given three chances to get the sled moving from the starting line. 5. The pulling tractor must stay between the lines of the pulling lane at all times. 7. In case of a tie there will be a pull-off to determine the winner. 9. Both boys and girls are eligible to enter, age limit 12 years. 10. The judge’s decision will be final for all pulls. 11. All contestants must be present by the time of pedal pull with a signed permission slip in hand. The required signature of a parent or guardian releases Colchester South & Harrow Agricultural Society from any financial responsibility due to accident. 12. 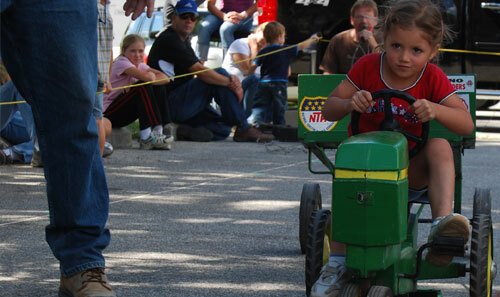 Registration for the tractor pull will be one hour before pedal pull time on Sunday, September 2nd, 2018. 13. Only the first 25 children in each class to register will be qualified to participate. Child must be accompanied by an adult or guardian at time of registration. 14. Spectators need to stay behind ropes. 15. Prizes will be awarded.